SAFFORD – Graham County Superior Court Judge Michael D. Peterson has said he believes 80 to 90 percent of all criminal cases he adjudicates has a root cause of drug addiction. After two people being arrested for stealing a donation kiosk from Walmart to get money for heroin, two different people are facing charges after allegedly stealing pants and returning them for a gift card, which they then sold for cash and purchased heroin. 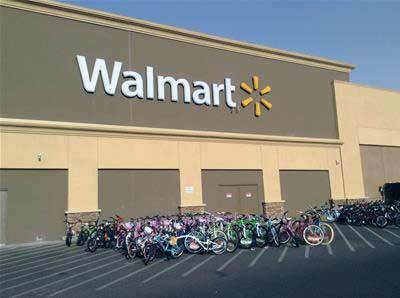 A Safford officer was dispatched at about 11:39 a.m. on Sept. 19 to Walmart at 755 S. 20th Ave. regarding the fraud. After viewing store surveillance footage of a man and a woman stealing four pairs of pants, the officer was given the name of Phillip Jessie Gonzales Jr., who was the person who had given identification during the return process. The couple received a gift card worth $106.74 for the fraudulent return. The officer looked into Gonzales and found that a woman by the name of Carmen Dominguez had recently been involved with him. The officer then compared Dominguez’s driver’s license with the woman and the surveillance footage and it was a match. Officers then responded to an address in the 900 block of W. 7th Street that was Gonzales’ last known address. Upon arrival, however, Dominguez looked out the curtains, saw the officers and refused to answer the door. The officers then contacted the owner of the residence, who rents the home to Gonzales’ mother. The owner said neither Gonzales or Dominguez should be in the home and responded to the residence. The owner then knocked on the door and Dominguez opened it. The officers were then allowed inside and questioned Gonzales and Dominguez. After initially denying the charges, Dominguez allegedly admitted to stealing the pants and returning them and that Gonzales only used his identification to perpetrate the crime. Dominguez said the pair had sold the gift card for cash, which they then used to purchase heroin. He said they had smoked heroin and marijuana just prior to the officers’ arrival. A small amount of marijuana and .2 of a gram of heroin was found in the residence, along with some drug paraphernalia. Gonzales and Dominguez were released at the scene, and violations regarding fraudulent schemes and artifices, possession of a narcotic drug, possession of marijuana and possession of drug paraphernalia were forwarded to the Graham County Attorney’s Office for review and official charging. To help alleviate additional crimes rooted in drug addiction, Judge Peterson, Graham County Probation, law enforcement, prosecutors and defense attorneys have come together to form a drug court, which focuses on treatment for drug addiction and gives those who commit crimes a chance to clean up their records and their lives.